Featured amenities include a computer station, a 24-hour front desk, and luggage storage. This hotel has 3 meeting rooms available for events. Free self parking is available onsite. Located in Beaumaris, Bishopsgate House Hotel is a 2-minute drive from Beaumaris Castle and 7 minutes from Plas Cadnant Hidden Gardens. This hotel is 6.4 mi (10.3 km) from Bangor University and 12.5 mi (20.1 km) from Caernarfon Castle. Beaumaris, a welcoming and pretty little seaside town, is situated at the eastern entrance to the Menai Strait on the isle of Anglesey. Full of rich history, good food and culture, it also has an abundance of excellent accommodation. Beaumaris is an ideal base from which to explore Anglesey, nearby Snowdonia and the beautiful North Wales coast. The most technically perfect castle in Great Britain and the last Welsh Edwardian castle to be built under the rule of Edward I in 1295, Beaumaris Castle is an awe-inspiring sight. However, money and supplies ran out before the castle could be completed and it now stands as the great unfinished masterpiece of Wales. Originally built on marshlands, it is from here that French builders gave the town its name, 'beaux marais' which, literally translated, means beautiful marshes. Other historic points of interest throughout Beaumaris include the 14th-century St Mary's parish church and the 14th-century Tudor Rose, one of the oldest original timber-framed buildings in Britain. Beaumaris Gaol was built in 1829 and, while no longer in use, it remains largely unaltered and is now a popular museum. The town's Victorian pier was first opened in 1846 and used to be the landing stage for steamships visiting from Liverpool. It is still operational today and is a popular base for yachts and pleasure boats of all kinds. This is especially so during the busy summer months, when many younger visitors can be found crab fishing from the top of the pier. Hikers will certainly revel in the stunning nearby Snowdonia mountain range. There is also an outdoor paddling area for youngsters during the summer and plenty of ideal fishing areas. Sailing is very popular in the area with a two-week-long regatta taking place every year along the Menai Straits. For those looking for some other form of entertainment, there is plenty to be found in and around Beaumaris. There are regular produce markets and live music events throughout the year, as well as a new annual food festival and an arts festival in the summer. An Easter egg hunt takes place in the spring, and December brings with it Victorian Christmas celebrations and historic re-enactments within the castle walls. 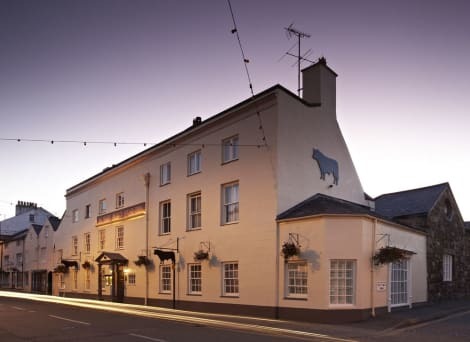 While there is an abundance of fine eating establishments throughout Beaumaris, visitors to the town should not pass up an opportunity to dine in the famed Bulls Head Inn. Built in 1472, General Thomas Mytton made the inn his headquarters during the siege of Beaumaris during the second English Civil War in 1648, and writer Charles Dickens once stayed here. You'll never be short of something to do in Beaumaris, so book your stay at one of our Beaumaris hotels today.